That's one of the things I miss most of my kids being grown...no candy for me! and no candy here.. no kids young enough to trick or treat. The candy I bought to give out is gone.. and I'm on weight watchers and never touched a piece! that is amazing! That picture brings back memories. I remember doing the same thing with my sister, spreading everything out and checking out our haul! oh, yeah, I admit it....at all the peanut m and m's, and a few more! Heavens, I was glad we didn't have many trick or treaters...more for me! 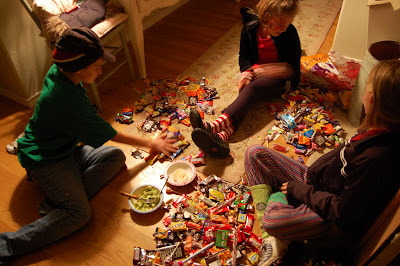 My kids use to dump out all their candy and give me all the candy they didn't like, it worked out well for me...I also use to let them stuff themselves with candy on Halloween night so by bedtime they were more then happy to hand over their candy sacks to me and then they could pick out X amount of pieces everyday after Hallowween until the candy was gone...it work well for us.